This is not really a shooter however it is very influential to the tactical shooter genre. One creeps as a thief by villas and dungeons and steals whatever is valuable that one can find. In numbers the guards will always defeat you, but one shoots the unsuspecting with an arrow in the back or lashes out at them with a club and one can stealthily pass them by. Looking Glass once again came up with an innovative game! Indeed the graphics are weak, however, the atmosphere is strong (even if the melding of the Middle Ages with industrialization might strike you as strange) and crouching down in the shadows leads sometimes to adrenalin rushes. The degree of difficulty is high and goals are announced with each mission. Miscellaneous items will help with fulfilling the orders: moss arrows dampen the step noises, aquatic arrows extinguish the torches and give more welcome shadows to hide in, rope arrows can in wood beams be shot and serve to climb into otherwise unattainable places. Sometimes one must consider how one can proceed onward. The levels in the houses are the most fun and those that are stuffed with dungeons, monsters, and zombies are indeed creepy, however they would not have been necessary for the game to succeed. Altogether, the game is very much innovative and exciting but also can be frustrating. It is only suitable for the patient shooter fan who can resign themselves to the fact that one cannot kill every opponent here just like that. 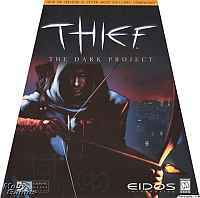 Thief Collection 4CD ISO Demo 3.2GB (upped by Shattered)NOTES: Includes Thief, Thief 2, and Thief 3.